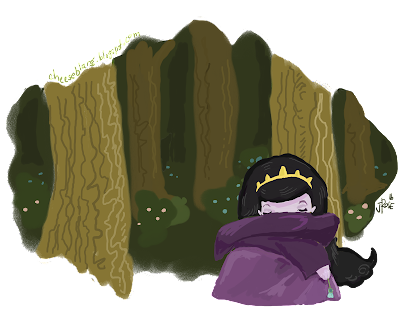 Here is the second part of my story, a fairy tale written for lonely princesses. If you missed the first part, you should go read it here, because... wait... why do I have to explain this? Things go in order for a reason. Go read it, we'll wait. Okay, ready? Let's go. She sat for a long time, crying and whining and being generally pathetic. 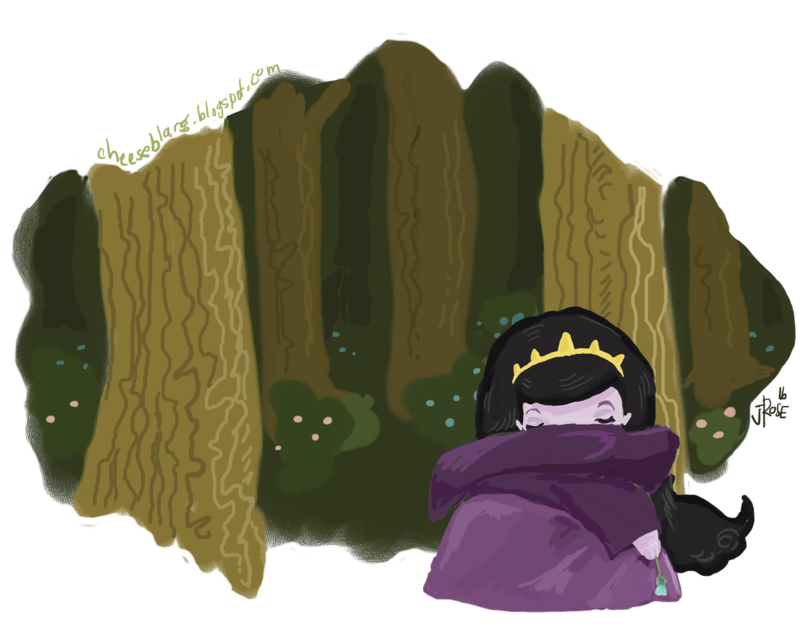 From the trees behind her, she heard a low growl. She turned mildly, blinking slowly. A great silvery wolf was poised amongst the trees peering at her. The wolf sat down and considered her carefully. “Not really the reaction I usually get, you know?” He said. The wolf, in an act of great effort, rolled his eyes at her. “Well, really, your attitude makes this so much less satisfying. Nevermind.” He got up and began to leave. “Right, of course,” she said angrily. 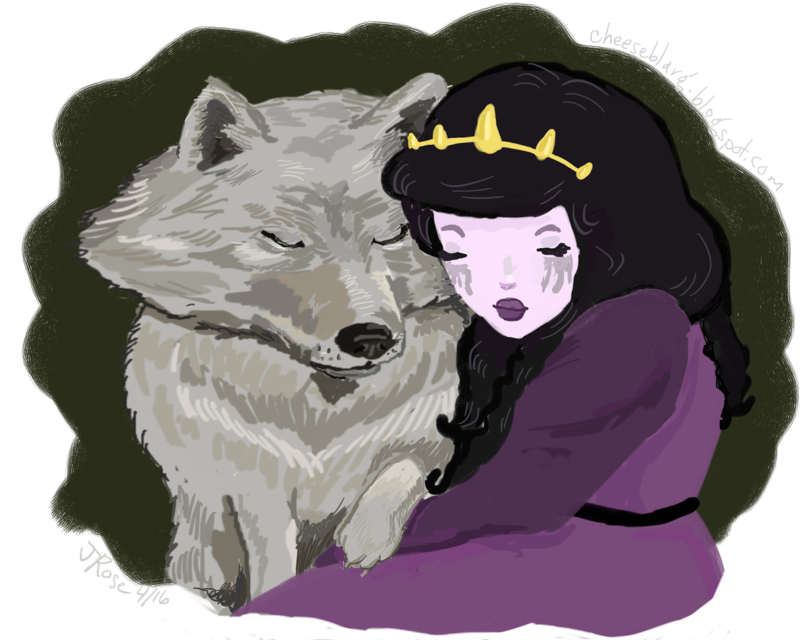 “A stupid wolf won’t even eat me!” She began to sob again. “Now stop that!” He said coming closer to her. “Go away!” She shouted, turning towards him sourly. “If I might ask, what about your life is so terrible that you would be fine with becoming my breakfast?” The wolf sat down beside her. 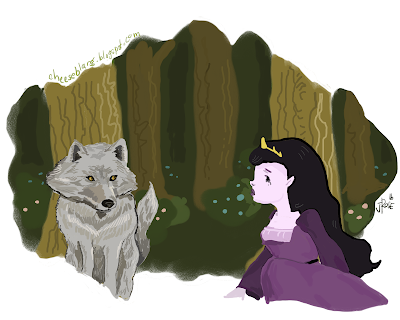 “Well, yes,” the wolf said honestly, as contrary to belief, wolves are really quite honest. She reached over and stroked his gray fur. He looked at her warily but allowed her touch. 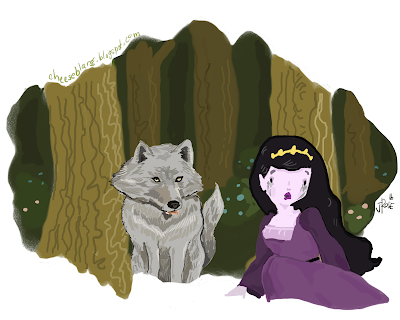 “So, really, what is so terribly awful that you are wallowing alone in a forest?” The wolf asked. Come back next Thursday morning for the next installment! or for at least a dollar a post, you can see the next installment a few days earlier! Oh how I adore your artwork. I love that wolf and the twist that the story seems to be taking!